How do I type the euro value sign € on a Mac? I've tried bashing on my keyboard with the ⌥ alt/option key pressed with the ⇧ shift key pressed but I do not seem to be able to find how I can get the euro value sign. What keystrokes do I need to use to get the euro € sign? On an American English keyboard you can type the European Currency symbol (€) with Option + Shift + 2. The Euro Currency symbol is found at ⌥⇧2 on the US English keyboard. In general, if you want to discover what symbols can be found on your keyboard when you press the modifier keys, you can use the Keyboard Viewer window. 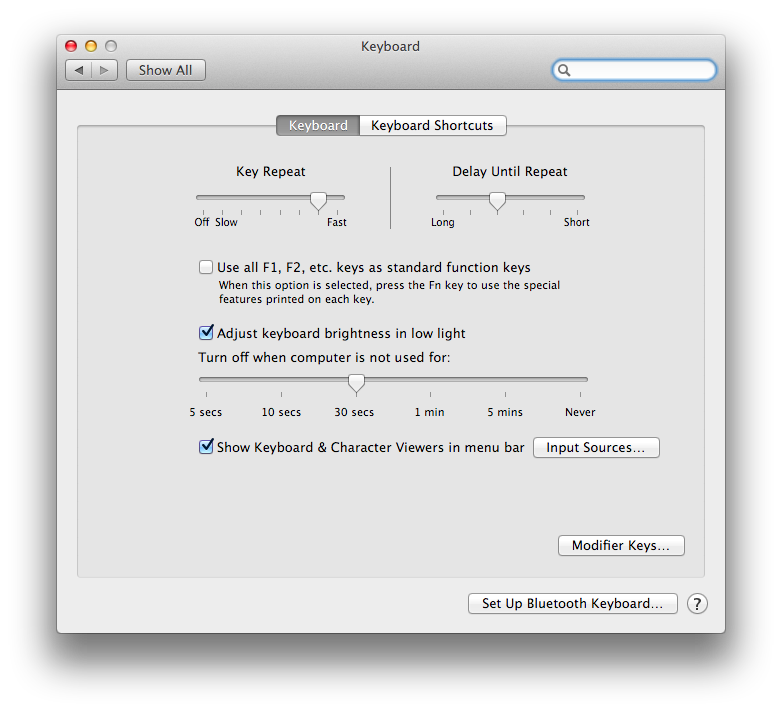 Make sure System Preferences » Keyboard » Keyboard » Show Keyboard and Character Viewers in menu bar is checked. Make sure System Preferences » Language & Text » Input Sources » Show Input menu in menu bar is also checked. Once you have the keyboard viewer enabled, go to the keyboard menu in your menu bar (it will look like either a picture of a keyboard or a flag representing the keyboard layout you have selected) and chose Keyboard Viewer. A window will appear with a picture of your keyboard. If you hold down the option, shift, or option and shift keys, it will show you what the keys on your keyboard do with those modifier keys pressed. Very similar to the British/US 'pound' symbol, swapped between shift/3 or alt/3 depending on keyboard. An option to use once you know how to get the € symbol is to create a text shortcut for the symbol on your Mac for faster typing. You can do this using text replacement. 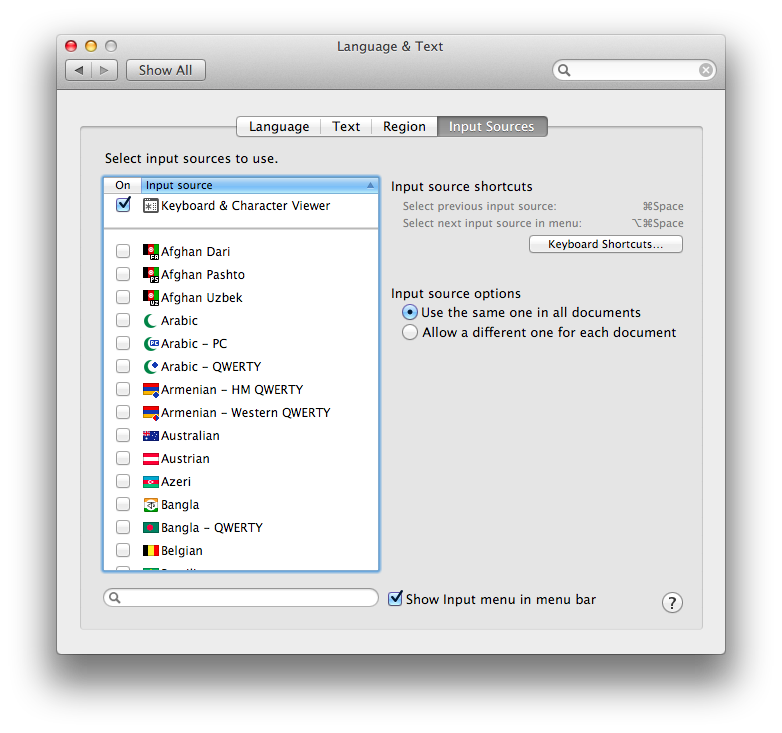 Launch System Preferences and click on Keyboard (Language & Text on previous versions of OS X). Click on the Text tab. The Replace and With columns appear. Click on the + button at bottom-left to add a new text shortcut, which opens a text field for you to type your trigger text, for example euro. Press ⇥ tab key or mouse over to the adjacent text field (under the With column) and enter the actual € symbol. This becomes the resulting replacement text. And you’re done. The next time you enter “euro” it will be replaced automatically with “€”. But you can always press the Esc keyboard button (to cancel the text replacement) if you actually want to type out the word “euro”. This also works for iOS devices under Settings → General → Keyboard → Shortcuts. Please note that this does not work automatically in every app. I’ve confirmed it works on iMessage, Notes, Reminders, Mail. For iWork (e.g., Pages, Keynotes, Numbers) you’ll have to add the shortcuts as they use their own text replacement functionality. For example in Pages, click on the Pages menu item, then click on Auto-Correction tab, and add any text shortcuts in the same way as above. Here you can even choose to toggle (on or off) which text shortcuts you want to be active. 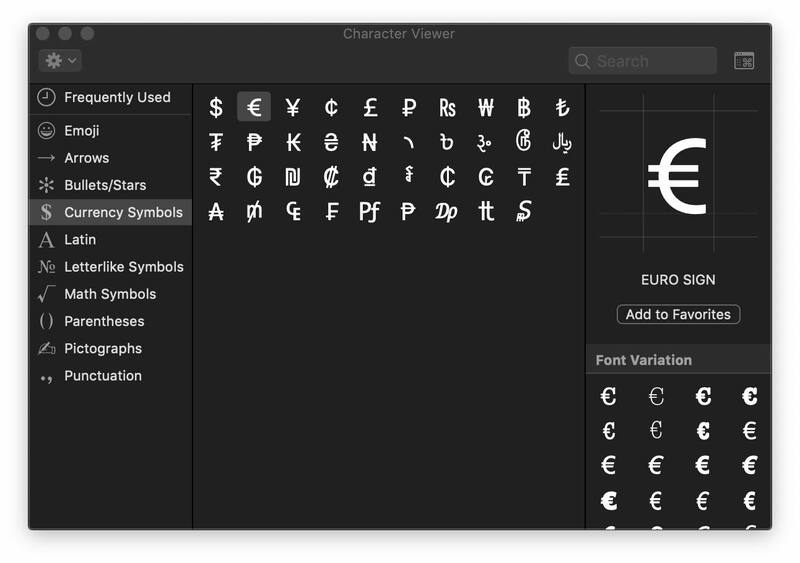 The Character Viewer tool built into macOS offers the symbol you want, depending on what fonts you have installed. To access, choose the Show Emoji & Symbols menu item in the icon menubar. May be named Character Viewer in older versions of macOS. Find the menu item next to Keyboard Viewer menu item. If you do not see this menu amongst your icon menus, go to System Preferences > Keyboard. Check the Show Input menu in menu bar. On the left, click the Currency Symbols grouping. Note the option to Add to Favorites on the right side. Convenient for frequent use. 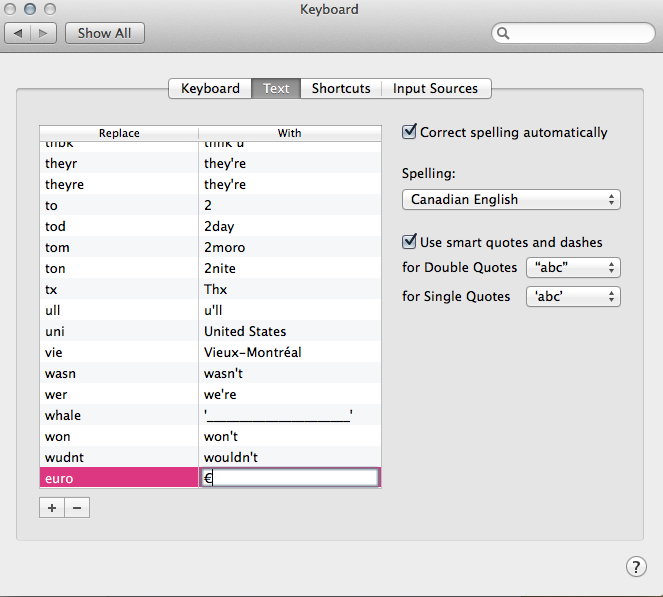 For Latvian keyboard layout on my mac the combination is Shift+Opt+Q. If you are using Czech Mac OSX keyboard, you will find € sign under combination of ⌥ + r.
just and addition here if you have you option key used to swap spaces this will override the keyboard shortcuts. Uncheck these options to key your true keyboard shortcuts back. 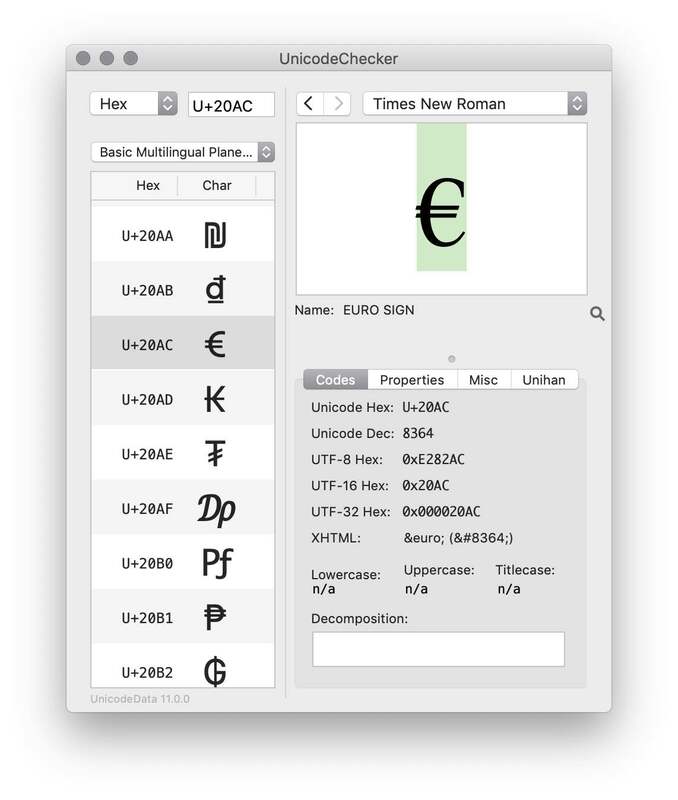 The free-of-cost UnicodeChecker app for macOS lets you find and copy/paste any of the over 100,000 characters defined in Unicode. This includes EURO SIGN with code point number 8,364. This app also shows a list of fonts that include a glyph for this character. Notice the menu item Favorites > Add Current Codepoint to Favorites…. If frequently used, you may find it convenient to add an item to the Favorites menu for this particular character. 2016 new MacBook Air. Euro sign is completed by pressing Alt key & 2. And then paste it into your email or whatever. Not the answer you're looking for? Browse other questions tagged macos keyboard . Is multiple magic items in one inherently imbalanced? Are sorcerers unable to use the Careful Spell metamagic option on themselves?